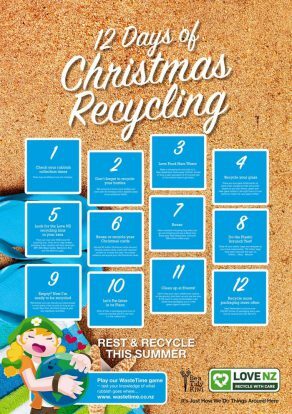 During the festive season Kiwis generate 30% more waste and there is also a whopping 400% increase in waste in our favourite holiday destinations. But it’s not just New Zealanders – about 500,000 overseas visitors visit over summer, adding to our waste problem. At the same time, we spend $6 billion on Christmas-related shopping and gifts, with a massive increase in packaging and food consumption. Drinks sales increase 300% over normal levels and whilst recycling doubles, there is also a huge increase in recyclable glass, cans and plastic that end up in landfills – especially when people are away from home. The good news is that wherever you are in New Zealand you can choose to recycle. All your glass, plastic drinks containers, cans and cartons can be recycled. Most councils will recycle take-away pizza boxes if you put them out in your kerbside collections. Soft plastic bags can be recycled at Countdown, New World, PAK’nSAVE, The Warehouse and other participating retailers– so you can recycle the soft plastic wrapping from your Christmas food and groceries as well as the plastic courier packs which deliver your online shopping (www.facebook.com/softplasticrecycling/). When you are out and about, look for one of over 2500 Love NZ recycling bins to recycle your cans, bottles and paper (http://www.recycling.kiwi.nz). If it can’t be recycled “Be a Tidy Kiwi” and put it in the rubbish bin for a litter-free New Zealand. Get behind our beach clean ups with The Breeze and More FM (https://www.facebook.com/JustHowWeDoThings/). Love NZ and Be a Tidy Kiwi have launched a joint TV advertising campaign, which features Lucy Lawless and Ian Mune with a companion digital campaign promoting The Waste Time game. The message is “Let’s Put Litter in its Place. It’s just how we do things around here. Find the game and play at: www.wastetime.co.nz.